The Pear Kingdom is the thirteenth kingdom in Donkey Kong Jungle Beat. In the original version of the game, it is the first kingdom linked to the B Barrel and can be accessed by completing all the kingdoms linked to the J Barrel, defeating the Cactus King, and collecting twenty-five or more Crests. In the New Play Control version, it is the fourth kingdom linked to the D Barrel and can be accessed by obtaining three crests in the other three D Barrel kingdoms. It is the dominion of Gloat-Hog. At the end of every level in the kingdom, Donkey Kong eats a giant pear. 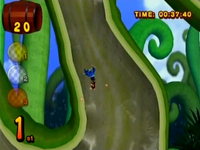 Deep Sea Sprint is the first area of the Pear Kingdom in the GameCube version. The entire level takes place underwater, however, it is a relatively short level. Donkey Kong has to race three Sea Turtles to the finish line here. The level features a few obstacles, such as the heavy water currents, which can speed the ape up if he travels in their direction. Jellyfish also appear in this level as obstacles; however, they can only hurt the ape and never help him. Although winning the race is not necessary to complete the level, it can give the Kong more beats. In the race, third place gives the Kong 100 bonus beats, second place awards him with 300, and first place gives the primate 500. However, last place does not give the ape any beats at all. Helibird Dash is the first area of the Pear Kingdom in the New Play Control! version. 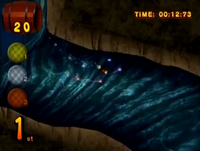 The level takes place inside a giant hollow vine. Helibird Dash is a relatively short level and conceptually very similar to Chopperbird Race. Donkey Kong has to race four Helibirds to the finish line with his own Helibird. The level features no enemies and few obstacles, and the ape must simply move his Helibird through the narrow pathways quickly. However, small, pink flowers are located throughout the whole level, and the ape must try to come near them, as they produce heavy winds that can push the Helibirds forward faster. Winning the race is not necessary to complete the level, however, completing the race before the ape's opponents can help him gain more beats and, as a result, earn more crests. Losing to all four Helibirds causes the ape to earn no beats, while coming in third place in the race gives him 100 bonus beats. 300 beats are awarded if the ape achieves second place, and first place gives him 500. Clock Tower is the second area of the Pear Kingdom. 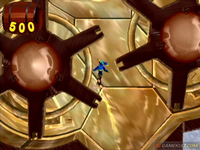 As its name implies, the level takes place in a clock tower with gears serving as obstacles. A new type of Helper Monkey is introduced here, and, unlike other Helper Monkeys, this type is suspended on a line instead of a bush, moving alongside Donkey Kong as he climbs the area. Two different kinds of Jungle Buddies appear in this level: Helibirds and Flurl. The two buddies can help the ape progress to the giant pear at the end of the level. Gloat Hog is then encountered in a volcano-like setting. He looks like all other Hog bosses, but with black skin and a grey Mohawk. During the battle, Gloat-Hog attacks by using the other Hog's attacks: throwing durians electrified coconuts, charging near the opponent and slashing, and firing mentally created spheres of electricity. After losing half his health, Gloat-Hog gains the ability swiftly move between platforms. After being defeated, he falls to the ground in defeat, unconscious. This page was last edited on April 12, 2019, at 13:25.